"The Doctrine of Fascism" ("La dottrina del fascismo") is an essay attributed to Benito Mussolini. 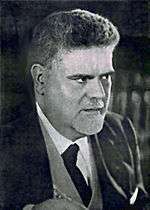 In truth, the first part of the essay, entitled "Idee Fondamentali" was written by philosopher Giovanni Gentile, while only the second part ("Dottrina politica e sociale") is the work of Mussolini himself. It was first published in the Enciclopedia Italiana of 1932, as the first section of a lengthy entry on "Fascismo" (Fascism). The entire entry on Fascism spans pages 847–884 of the Enciclopedia Italiana, and includes numerous photographs and graphic images. FASCISMO - Movimento politico italiano creato da Benito Mussolini (Fascism - An Italian Political Movement Created by Benito Mussolini). The second section of the essay is titled: "Dottrina Politica e sociale." The Mussolini entry starts on page 847 and ends on 851 with the credit line "Benito Mussolini." All subsequent translations of "The Doctrine of Fascism" are from this work. A key concept of the Mussolini essay was that fascism was a rejection of previous models: "Granted that the 19th century was the century of socialism, liberalism, democracy, this does not mean that the 20th century must also be the century of socialism, liberalism, democracy. Political doctrines pass; nations remain. We are free to believe that this is the century of authority, a century tending to the 'right', a Fascist century. If the 19th century was the century of the individual (liberalism implies individualism) we are free to believe that this is the 'collective' century, and therefore the century of the State." For if the nineteenth century was a century of individualism (Liberalism always signifying individualism) it may be expected that this will be a century of collectivism, and hence the century of the State. —Benito Mussolini, "The Political and Social Doctrine of Fascism,” Jane Soames authorized translation, Hogarth Press, London, 1933, p. 20. The Fascist State lays claim to rule in the economic field no less than in others; it makes its action felt throughout the length and breadth of the country by means of its corporate, social, and educational institutions, and all the political, economic, and spiritual forces of the nation, organised in their respective associations, circulate within the State. (p. 41). —Benito Mussolini, 1935, "The Doctrine of Fascism", Firenze: Vallecchi Editore. The corporate State considers that private enterprise in the sphere of production is the most effective and usefu [sic] instrument in the interest of the nation. In view of the fact that private organisation of production is a function of national concern, the organiser of the enterprise is responsible to the State for the direction given to production. —Benito Mussolini, 1935, "Fascism: Doctrine and Institutions", Rome: 'Ardita' Publishers. Fascism, Noel O'Sullivan, 1983 pg 138: referencing; Mussolini's Roman Empire, by Mack Smith Penguin, ed., 1979, first published in 1976, pg 247. The Doctrine of Fascism, by Benito Mussolini, 1935, Firenze: Vallecchi Editore. Fascism: Doctrine and Institutions, by Benito Mussolini, 1935, 'Ardita' Publishers, Rome. Translation of the 1932 Enciclopedia Italiana essay "Doctrines" by Mussolini. This translation is by Mr. I. S. Munro, from "Fascism to World-Power" (Alexander Maclehose, London, 1933). It is part of a 1984 compilation book: Readings on Fascism and National Socialism; Swallow Press, Athens, Ohio, 1984. A Primer of Italian Fascism. Book by Jeffrey T. Schnapp, Olivia E. Sears, Maria G. Stampino; University of Nebraska Press, 2000. My Autobiography. Book by Benito Mussolini; Charles Scribner's Sons, 1928. ↑ De Felice, Renzo (2006). Mussolini (in Italian). Il Duce: gli anni del consenso, 1929-1936. Torino: Einaudi. pp. 35–36. The Doctrine of Fascism by Benito Mussolini Complete text of the essay "Dottrina" (Doctrines). A translation of the Benito Mussolini "Doctrines" section of the "Fascism" entry in the 1932 edition of the Enciclopedia Italiana. From the publication Fascism: Doctrine and Institutions, by Benito Mussolini, 1935, 'Ardita' Publishers, Rome. Footnote numbers inserted in the text, and a footnote appendix (both not found in the 1932 encyclopedia article), are found in this 1935 publication. The footnotes contain excerpts from his speeches. What is Fascism? Quotes from Mussolini and Hitler. English. Includes a few excerpts from another translation into English of the Mussolini essay on "Doctrines" in the 1932 edition of the Enciclopedia Italiana. From The Doctrine of Fascism, by Benito Mussolini, 1935, Firenze: Vallecchi Editore. 2 Mussolini autobiographies in one book. English. Searchable. Click on the result titled "My Rise and Fall" (usually the top result). Then use the search form in the left column titled "search within this book."